Common eye conditions affect your vision and overall eye health, potentially leading to complications. Our specialists at Chapel Hills Vision Clinic have the expertise to diagnose and treat many common eye conditions. Learn about the comprehensive services provided by our Colorado Springs eye care team. What Are The Most Common Eye Conditions And Their Symptoms? Nearsightedness, or myopia, is a common condition where an individual sees objects up close clearly, while objects further away seem blurry. Farsightedness, or hyperopia, is another type of refractive error. An individual sees objects farther away clearly, while objects up close seem blurry. Astigmatism is a condition where the eyes do not focus light onto the retina evenly due to the curve of the cornea. The National Eye Institute indicates that when an individual has astigmatism, objects potentially appear blurry and stretched out. Presbyopia occurs with aging. The lens of your eyes is no longer able to focus on objects close up without difficulty. Age-related macular degeneration (AMD) results in the destruction of sharp, central vision and primarily occurs in adults 60 years of age and older. Symptoms of common eye diseases vary. Blurred vision, headaches, redness, dry eyes, squinting or straining your eyes to see, experiencing a halo, haze or double vision are all signs of common eye conditions that warrant prompt diagnosis from our eye doctors and optometrists. 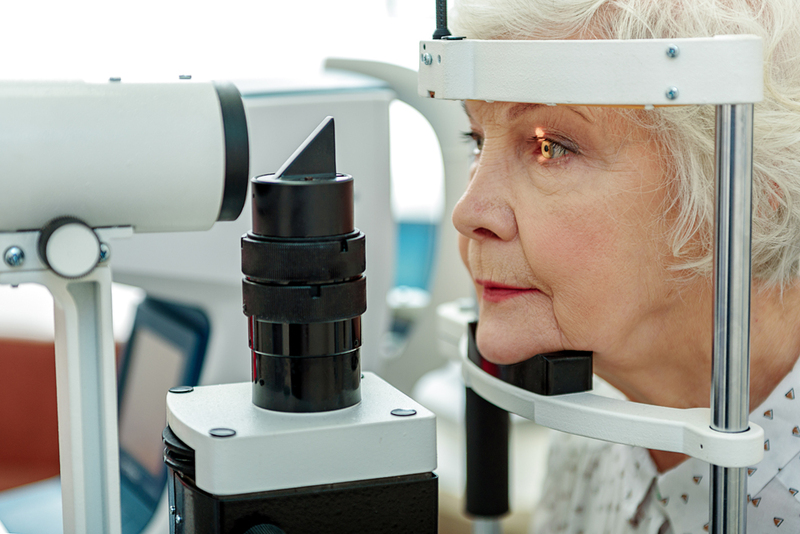 How Can An Optometrist Diagnose And Treat The Most Common Eye Conditions? Never assume that a common eye condition will not affect your overall eye health. Our Colorado Springs optometrists at Chapel Hills Vision Clinic have the experience and professional skills to diagnose and treat common eye conditions, giving you the best possible opportunity for improving your overall eye health. Getting a comprehensive eye exam is the first step towards diagnosis and treatment of common eye conditions. We perform a variety of tests that determine how well you see now and evaluate whether you have common eye conditions or eye diseases. Many people choose eyeglasses or contacts to help them see well. Others need or choose ocular surgery. What Treatment Options Can An Ophthalmologist Provide With Ocular Surgery? Some eye conditions, although common, potentially lead to the need for surgery.If you have cataracts, the ophthalmologist removes the lens of the affected eye and replaces it with an intraocular lens (IOL). Some people choose LASIK surgery to correct their vision, rather than continue wearing glasses or contact lenses. LASIK involves reshaping the cornea and results in sharper vision within hours. Conductive Keratoplasty helps farsighted patients see more clearly after the ophthalmologist uses CK to steepen the cornea, giving patients’ better close up vision. Our professional team has a reputation for providing exceptional eye care in and around Colorado Springs. Contact Chapel Hills Vision Clinic for your first appointment today. We can treat your eye conditions at our facility.